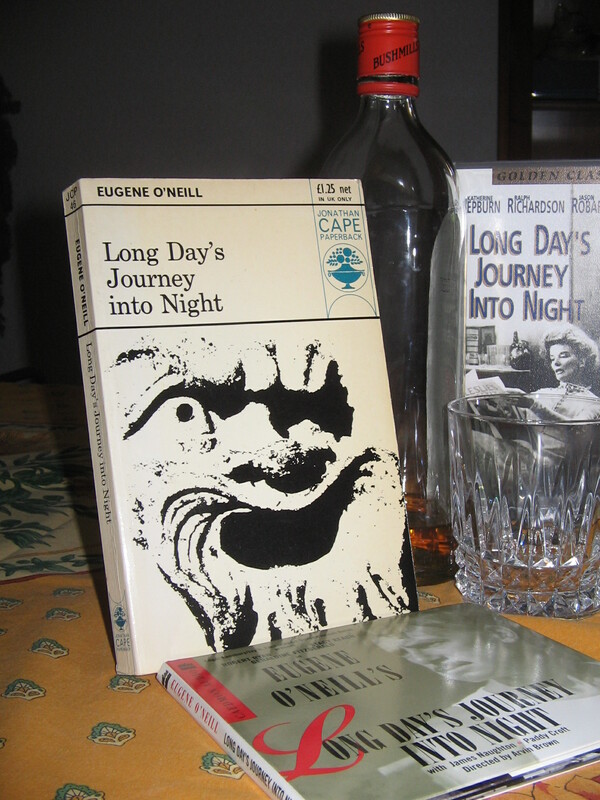 I have often wondered why it is that Eugene O’Neill’s Long Day’s Journey Into Night has so powerful a hold on me. I have read some of his other plays as well, and, impressive though many of them are, none – to my mind, at least – comes even close to this particular achievement. As is well-known, O’Neill depicted his own family here – his parents and his elder brother, with himself as the younger brother Edmund – and that the play was so painfully personal, that he did not allow either publication or performance within his own lifetime. But as, I think, with any work, we must judge it purely on its own terms: the author’s biography has no place in literary criticism. And even leaving aside the biographical element in this work, I find it a stupendous achievement. The play opens in the morning, just after breakfast, in the somewhat shabbily furnished family home of the Tyrone family. Almost immediately, we meet the Tyrone family – James Tyrone, the former matinee idol of stage and still handsome and vigorous in his early 60s; his wife, Mary, some ten years younger but looking much older; and the two sons – the elder, Jamie, and the younger, Edmund. Apart from a maidservant who has a comparatively minor role, we are to be stuck with these four characters in this single set for the next three hours or so (longer if the full text is performed). A series of scenes takes us through the day, and the very long final scene takes us into the depths of the night. Long day’s journey into night indeed. But the title is clearly metaphorical as well as literal: the darkness that threatens throughout envelops the characters by the end, and we, the audience, find ourselves overwhelmed with pity for these characters, and also with a sense of tragic terror. So why do I keep returning to this gruelling marathon of misery and hopelessness? I wish I knew the answer to that. But perhaps the best way of trying to reach an answer is to examine the work. In the first scene, there are unexplained tensions and undercurrents. The father and sons seem particularly concerned about the mother: why, we do not yet know. And there seems a certain hostility between father and elder son: they seem ready to jump at each other at the slightest. These things aren’t explained immediately. The various events that have led to the current situation all occurred in the past, before the curtain had risen, and the action we see on stage – insofar as it can be called “action” at all – concerns these characters trying to understand that past, trying to understand how, and why, the past has made them what they are now. “The past is the present, isn’t it?” asks Mary Tyrone at one point. “And it’s the future too.” What we see is the present, but it is the past also. In a sense, the entire play is one long exposition. But what can these people learn about the past that is new to them? There is no surprise revelation: they all know about the past. They have brooded endlessly on those events of the past, over and over again – they cannot do otherwise. They are so close to each other that not one of them can make the slightest move without hurting someone else; and they keep rehearsing past events almost obsessively, blaming each other, alternately blaming and justifying themselves, unable to come to terms with what has happened. The past does not emerge in chronological order. Rather, it emerges in bits and pieces, and we have to piece it together ourselves. We gather that when Edmund had been born, the doctor attending his mother had put her on to morphine, and that she had, as a consequence, become addicted. The elder brother blames his father for being too tight-fisted to get a proper doctor. The elder brother himself has wasted away his considerable talents in dissipation and drunkenness, and is now merely a pathetic alcoholic wreck of a man, a wastrel. But the worst of it is that he is also a very intelligent man, and can see quite clearly what he has become, and what he might have been; and he hates himself perhaps even more than he hates his father. He is full of loathing and disgust, but the deepest loathing and disgust is reserved for his own self. He has a sort of possessive love for his younger brother, with whom he has always been close; but he insists, especially when he is drunk, on seeing the very worst side of everything and of everyone – even of himself; and can’t help wondering out loud whether he had deliberately tried to destroy his brother under the guise of friendship because, as he puts it, “I did not want to be the only corpse round the place”. On the particular day on which this play takes place, they are all waiting anxiously for some news about the younger son; and in the afternoon, the worst is confirmed: Edmund has tuberculosis, which, in those days, was virtually a death sentence. The mother is outwardly in denial, but inwardly, she is terrified, and her fears prompt her back to her addiction. By the end of the play, she is like a ghost, completely lost to a present too terrible for her to face, her mind wandering vaguely through various events of the past. These characters all seem to hate and love each other at the same time. This is what makes the whole drama so heart-rending. There are many explosive moments of confrontation, but beneath it all is a tremendous love and pity, and, yes, even tenderness. This is never depicted in sentimental terms: indeed, on first viewing, they seem to do little except rage at each other. But they cannot help doing this: they cannot help wounding each other any more than they can help wound their own selves. As the play progresses, we become increasingly caught in the complex coils of these relationships, and soon, we find ourselves inextricably bound. There is much repetition, as is inevitable: these characters’ minds have been circling endlessly around the same familiar themes. I remember seeing Jason Robards talking about this aspect of the play (Robards was particularly closely associated with this play, having played the elder brother in his younger days, and the father when he was older), and he insisted that every repetition occurs in a different dramatic context, and throws new light on the situation and on the characters. That is no doubt true, but the effect created is not one of a linear forward movement, but rather of a sort of spiralling. By the end, one feels overwhelmed by the sheer cumulative weight of it all. The light of day passes soon enough. In the third of the four acts, the mother returns from a car ride, accompanied only by the maidservant. She has already taken enough morphine to be only vaguely aware of the present: in a piece of virtuoso dramatic writing, she is given a series of monologues in which her mind spirals back to various events of the past, re-interpreted in her own way. And punctuating all this is the mournful sound of the foghorn, coming intermittently from outside. The maidservant, who is not too bright to start with, has become tipsy on the whiskey she has been treated to, and she can’t understand what her mistress is saying; but her mistress is not really speaking to her anyway. O’Neill somehow maintains this scene over a very long stretch, and time seems almost to stand still. I think it’s one of the most remarkable scenes in all drama. The final drink-sodden act is the longest: it usually lasts for well over an hour. We are now in the darkest depths of night. The younger son has returned home drunk; the father is sitting on his own in the darkness, afraid to go upstairs and see his wife. The scene between father and son is extraordinary: for perhaps the very first time, they reach – albeit through acrimonious recriminations – a sort of understanding of each other. We begin to see here the father’s tragedy as well, and find ourselves touched as he recalls that one moment in his life that is still worth holding on to – the memory of when the great Edwin Booth (“the greatest actor of his time, or of any other time”) – had praised his performance of Othello, and had said “That young man is playing Othello better than I ever did”. James Tyrone had subsequently wasted that talent, but all the same, he did have that talent. And amidst the wreckage of his life, he holds on to its memory, because this really is all he does have to hold on to. Then, the elder son, Jamie, comes home, dead drunk. The father doesn’t want to be with Jamie in this state, and he steps outside, and before Jamie collapses into a drunken stupor, we have, between him and Edmund, perhaps the most electrifying and gut-wrenching scene of all. Here, love and hate are so close together, they seem inseparable. I know I said earlier that the work has to be judged on its own terms, but one wonders how the aged O’Neill must have felt dramatising his own beloved brother (who was dead by the time the play was written) with such openness, but at the same time with such love. The wounds exposed in this scene are particularly raw, and, even now, despite having read this many times and seen it in various productions, I find it emotionally harrowing. In the finale, the mother comes downstairs. She is by this stage far gone, and has lost all connection with the present. And as she starts rambling, the cynical Jamie, of all people, bursts into tears. The curtain eventually falls on this family, these people who have undertaken this very long day’s journey into night, staring into the deepest darkness. We are fortunate in having some very fine performances of this work available. For those with a multi-region DVD player, there’s the famous National Theatre performance from the early 70s, featuring what Dennis Quilley (who plays Jamie) subsequently referred to as Olivier’s “last great performance”. I haven’t seen this since it was first broadcast back in 1972: I was 12, and found myself transfixed by the drama. From what I hear, the text is very severely cut (the mother’s monologues in the third act are almost all gone). But for all that, from what I hear and from what I remember from my childhood viewing, it’s worth having, if only for Olivier’s deeply passionate performance – although the entire cast (Constance Cummings, Dennis Quilley, Ronald Pickup) are, I am told, very, very good. I really must get hold of this DVD. Sidney Lumet directed a fine film version of this. Lumet was an expert in directing within limited sets (Twelve Angry Men is perhaps the most famous example of this), and he uses all the techniques available to communicate the essence of this coruscating drama in cinematic terms: the lighting, camera angles, editing, are all the work of a complete master of cinematic technique. Katharine Hepburn is very effective as the mother, and handles her monologues superbly; Dean Stockwell is a fine Edmund, and Ralph Richardson gives a somewhat understated (but nonetheless effective) performance as the father. But best of all, perhaps, is Jason Robards as Jamie: one can see why he was so famous in this role. This film is well worth seeking out. There is also a DVD of the stage production directed by Jonathan Miller, with Jack Lemmon as the father and the then relatively unknown Kevin Spacey as Jamie. The mother was played by American stage actress Bethel Leslie, who emphasised more than is usual the mother’s manipulative ways, and her frequent recourse to emotional blackmail. Miller speeded up the play, getting the actors often to speak over each other: after all, he argued, these characters had heard it all before. This lightened the tone somewhat, and even introduced surprising elements of comedy; and it also meant that when the characters do hear something that is new to them (e.g. when James Tyrone tells Edmund of the praise Edwin Booth had given his performance of Othello), it really registers. I thought Jonathan Miller’s approach worked superbly well. And there’s also an audio recording from the early 60s which is now available once again, this time on CD. The mother is played with a startling intensity by Geraldine Fitzgerald: there are times when the character seems to be on the brink of an abyss, and she projects a sense of sheer terror. Robert Ryan plays a James Tyrone who feels things very deeply: it is, perhaps, the most touching performance I have come across of this role. Stacey Keach as Jamie is more obviously vulnerable than was the more hard-bitten Jason Robards, and James Naughton makes an excellent job of the role of Edmund. In short, anyone who wishes to experience this (to my mind) supremely great play is spoilt for choice. It is not something I would wish to experience on a regular basis: it is far too emotionally harrowing for that. But, for reasons I cannot fathom, it has an effect on me that tragedy, I am told, is supposed to have: it resonates very deeply with me, and I find something very cathartic about it.